Aloo ka cutlet is a very popular snack that is often served with tea. The recipe varies from region to region and here I am sharing the recipe of aloo ka cutlet the way we make at home. 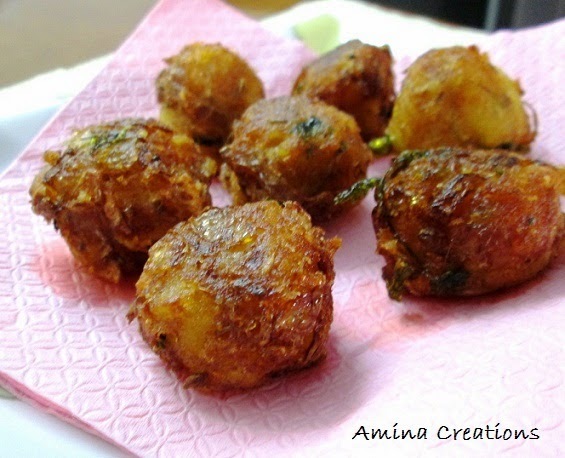 These potato fritters taste best when served hot with tomato ketchup. Take potatoes in a pressure cooker. Add ¼ tsp salt and ½ cup water and pressure cook for 3 whistles. Allow the potatoes to cool down and partially mash them. Heat oil in a non stick pan, add mustard seeds and allow them to sputter. Then add onions, curry leaves and sauté till the onions turn golden. Next add red chilli powder, turmeric powder and salt. Now add the potatoes and mix well. Finally add lemon juice, mix well and switch off the gas. Allow the potato mix to cool down completely. Meanwhile take a bowl and add all the ingredients of the batter and mix well. Add water little by little. The batter must be thick so that it can cover the potatoes. Once the potato mix has cooled down, make small balls and keep ready. Heat oil in a pan, and when oil is hot, dip the potato mix in the batter and deep fry till golden brown in colour. Transfer to a tissue paper and serve hot with ketchup or any chutney of your choice. would love to enjoy this on a cold rainy day !! Spicy and delicious snack, very tempting..